Redskins Cornerback Bashaud Breeland is forced to pump the brakes on his ascent to becoming a legitimate playmaker in the NFL. Earlier on Friday, the NFL handed down a one game suspension to the 2nd year Corner for violation of the League's substance abuse policy. Only hours later, Breeland suffered a right knee injury in 1 on 1 drills during Washington's training camp. The injury was not pretty, and it was eventually reported that the young Corner did some damage to his right MCL. Breeland could miss anywhere from 4-8 weeks; he will be absent for the rest of Redskins training camp. Fortunately, he will be able to serve his one game suspension even if he misses game time due to injury. As it stands right now, we can expect Breeland to be sidelined for the first four games of the regular season, maybe even a bit longer. His absence could have a negative impact on Washington's defensive performance early on in their 2015 campaign. The team's initial contests include matchups with the Dolphins, Rams, Giants, and Eagles in that order. The Redskins secondary will face its biggest challenge when they travel to New York and attempt to contain an explosive Odell Beckham Jr. and a healthy Victor Cruz. Bashaud Breeland went toe-to-toe with Beckham Jr. last year and held his own. It remains to be seen whether his teammates will be able to find the same success working against the 2014 NFL Rookie of the Year. Breeland's injury leaves an even heavier load to be carried by seasoned veteran DeAngelo Hall (who is coming off of a season-ending Achilles injury from 2014) and 2015 Free Agent acquisition Chris Culliver. David Amerson is another young Corner slowly reaching his potential. However, Breeland's absence will be felt at the beginning of the regular season. 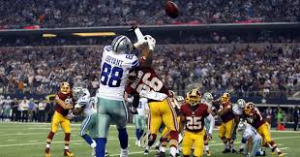 It isn't easy to replace a player who has the talent to shut down Dez Bryant on Monday Night Football. With Breeland out of the picture for x amount of weeks, DeAngelo Hall will resume his position as the team's top Corner and Chris Culliver is likely to take over the number two spot barring any training camp/preseason surprises. Washington will be without Breeland's services for some time, but this team will still be able to rely on a revamped pass rush to mask any deficiencies that may arise in the secondary. Washington has added veterans Ricky Jean Francois, Stephen Paea, Terrance "Pot Roast" Knighton, and Junior Galette via Free Agency to help bulk up the front seven. In addition to these moves, Washington also added towering pass rusher Preston Smith through the NFL Draft. Even without Bashaud Breeland, this team still has the pieces in place to make some noise on the defensive side of the ball. The Redskins dumped their assets into strengthening the trenches this offseason and the secondary will benefit as a result. After all, a good pass rush is a defensive back's best friend.